One of the easiest and most natural tears you will ever learn. For more than two years I've been using this practical tear to perform powerful and direct mentalism. For a long time I've kept this completely to myself, but it's come time to share this with all of you. Imagine a tear where in just two simple tears you get your peek and the dirty work is done. Imagine a tear where you can show all sides of the paper as you tear, meaning no heat is on you because the participant sees exactly what you see. Yet you are easily able to peek 50% of the entire paper. Imagine a tear that is incredibly easy yet very powerful and clean. This isn't one of those complicated tears with lots of steps. This is a tear for magicians, mentalists, hobbyists, beginners and professionals. Everyone wants to be able to read minds, and everyone wants to do it cleanly, quickly, and easily. The UBT is arguably one of the best ways to accomplish those goals. Included in this ebook are two full fledged bonus routines and an invitation to a private Facebook group to discuss further ideas and tips. 1st edition 2015, 54 pages. 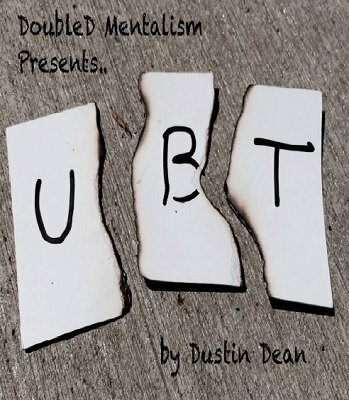 I've posted a review of UBT on another site, but I like it so much that I am going to tell you here that if you are new to mentalism and don't have a good billet peek, or you are not comfortable with the one that you are using, then you must give this a try. Once you work on it--and it's not that hard to do--you'll use it forever. As I said in my other review, it is a tear of the "instant/real-time peek" variety, unlike a traditional center tear. Bob Cassidy would question why one would use a technique where you take the peek when the audience is burning your hands as you rip up the billet instead of being more traditional and taking the peek on an offbeat or after a logical disconnect. That you have to answer for yourself. Whatever accomplishes the result deceptively is what you should use. If you use another peek such as a classic center tear, Osterlind's Perfected Center Tear, etc., and it serves you well, you might not need this. Then again, for me, this is a real thing of beauty. It's quick, clean, and straightforward. Highest recommendation.